Will you fight for the Republic and the brave Jedi? Or will you side with the Dark Side and the evil Galactic Empire? We have more licensed Star Wars costumes than you can shake a stick at. 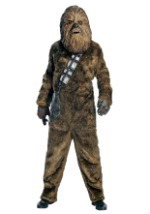 We have both mens and womens Star Wars costumes, so you can dress as your favorite character. Become Darth Vader, Obi-Wan Kenobi, Padme Amidala, or Princess Leia, to name just a few. We have deluxe replica versions of many of these characters too, for the ultimate realistic look for a Star Wars event or an intergalactic Halloween!